Guest post by Rebecca Galemba, Kaelyn DeVries, and Katie Dingeman. 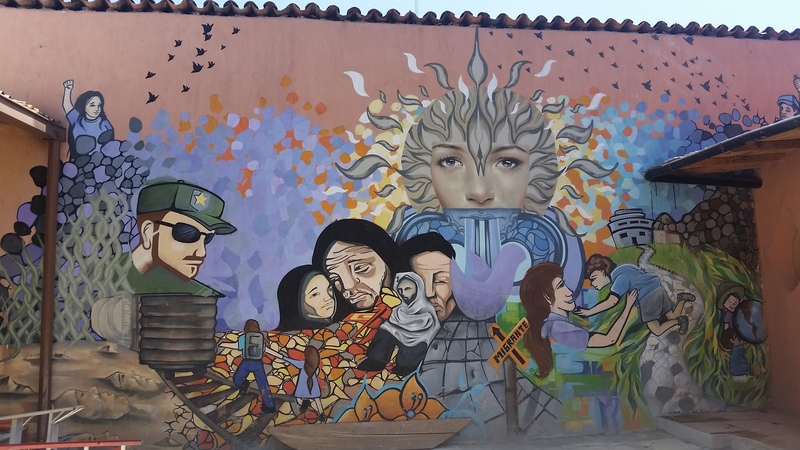 A mural at a human rights organization in southern Mexico. Photo via the authors. This is not the first time President Trump has suggested Central American immigrants pose a threat to US national security. In his State of the Union address earlier this year, he falsely claimed that MS-13 gang members from Central America find “glaring loopholes in our laws to enter the country as unaccompanied alien minors.” As scholarship consistently demonstrates, such rhetoric conflating migration with criminality is both inaccurate and misleading. But the problem runs deeper: for Central American migrants making their way north, these narratives undermine their ability to claim protections as refugees fleeing violence, enhancing their vulnerability along the migrant route and in Mexico. As part of an examination into migrant abuse, we interviewed 25 migrants, deportees, and staff at two shelters along the Mexico-Guatemala border. We also analyzed over 100 human rights complaints filed in shelters in this region since 2010. Our findings point to the risks migrants encounter in their home countries, during the migration journey, in Mexico, and at the US-Mexico border. Although overall migrant apprehensions at the US-Mexico border are at record lows, there has been an increase in migrant flows from Central America since 2014, particularly from the Northern Triangle countries of Honduras, El Salvador, and Guatemala. This is evidenced by the rise in asylum applications associated with widespread violence committed by an array of state and non-state actors throughout Central America. Meanwhile, President Trump continues to berate both Mexican and US policymakers for lackadaisical immigration policies and “open borders.” He blamed Mexico for not cooperating to control immigration, a discourse that could undermine programs coordinated between the two countries. 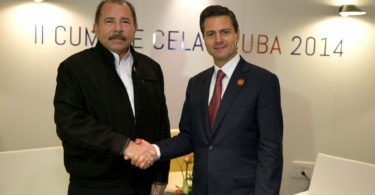 In reality, Mexico collaborates deeply with the US on border surveillance. This has especially been the case since 2014 with the enactment of the Southern Border Program. Since 2015, Mexico has deported more than twice the number of Central Americans than the US. As US immigration surveillance expands to the Mexico-Guatemala border, abuses against migrants continue to rise. Since 2012, crimes against migrants in the region increased 200%. Complaints to Mexico’s National Human Rights Commission levied by migrants against Mexico’s National Immigration Institute (INM) increased 40% from 2014-2015. Asylum applications in Mexico surged, increasing 326% from 2015 to 2017. Migrants forced to await often lengthy processing are routinely victimized by criminal actors, predators pretending to befriend or assist migrants, and – perhaps most commonly – agents of the state. Unlike the US, where asylum depends on membership in a specific social group, Mexico considers generalized violence as grounds for relief. Yet, as we learned from human rights advocates, “the problem is what happens in practice.” COMAR, the Mexican agency charged with asylum management, only has three offices and twenty-eight officers in the entire country. It advertises that 62% of petitioners for humanitarian relief receive some kind of protection, but the statistic is misleading. It fails to acknowledge the vast quantity of migrants who cross without seeking asylum, those deported despite credible fears, and the arduous process of accessing the asylum system and receiving protection. Between January 2014 and July 2016, Mexico detained and deported 448,000 people, but only 6,933, or 1.6 percent, applied for refugee status, and only 2,982 were granted asylum. In 2016, only five percent of the 130,000 Central Americans apprehended in Mexico applied for asylum, and presumably only a fraction will receive status. A 2011 revision of Mexico’s Migration Law decriminalized migration and opened new avenues for relief, including a humanitarian visa for migrants who experience crimes and collaborate with investigations in Mexico. But migrants are routinely deported before they become aware of their options or can file a claim. One migrant who we call Juan, for example, was beaten by immigration agents in Northern Mexico who then stole his belongings and sent him to Siglo XXI, Latin America’s largest detention center. 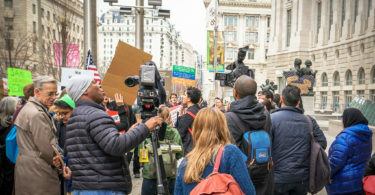 While detained, Juan was informed of his legal right to request a humanitarian visa, but he was deported to Guatemala before he could file the claim. Since 2015, denouncing a crime to receive humanitarian protection in Mexico requires processing a claim with the Unit for the Investigation of Crimes for Migrants. But migrants abused by state agents often find that, as one lawyer related, “[officials] all cover for each other.” 99% of crimes against migrants remain in impunity. As the US State and Defense Departments commit over $160 million to enhance security, information sharing, and communications in support of Mexico’s Southern Border Program, Mexico’s humanitarian infrastructure remains opaque, understaffed, and mired in corruption. Insufficient access to humanitarian immigration protections in a context of enhanced deportation and heightened economic insecurity produces a humanitarian black market. Criminal actors sell stories for migrants to compel asylum officials. Corrupt state agents sell otherwise “free” forms. Actors claiming to assist migrants offer rides to government offices to process paperwork, at a price. The border securitization industry thus renders it profitable to exploit migrants. As Galemba argues, tough immigration policies targeted at vaguely defined security concerns – without attention to root causes of migration – produce smugglers, incentivize corruption, and enhance migrant vulnerability. This is precisely why migrant caravans are needed. They ensure asylum seekers fleeing persecution receive protection against a wide array of abuses en route. They represent more veritable forms of humanitarian protection than the insufficient and deeply complicit systems of relief and redress currently entwined with the security apparatus of the state. Rebecca Galemba is Assistant Professor at the Josef Korbel School of International Studies at the University of Denver. Her book, “Contraband Corridor: Making a Living at the Mexico-Guatemala Border,” is available from Stanford University Press. Kaelyn DeVries is an MA candidate in International Security at the Josef Korbel School of International Studies at the University of Denver. Katie Dingeman is Assistant Professor of Sociology at California State University, Los Angeles.